Long Distance is a comic that takes advantage of the comic book format, using a different color to identify each location, the story makes sure the reader always knows where the action is happening. Sweet and poignant, Long Distance explores relationships, technology and distance. "Thom Zahler remembers that comics can be about more than explosions and tights, that they can be about funny, sad and true relationships between people. And we're all the better for it." "Long Distance is an honest romantic comedy that goes straight for your nerd funny-bone. You fall in love with the characters as quickly as they themselves do, and similarly don't want the date to end." "With Love and Capes, Thom Zahler proved he was a master at mixing humor and heart with heroics. Now, he brings that same blend of romance and revelry to Long Distance–a story that, while rooted in reality, is already shaping up to be an equally exciting adventure!" "I feel as though Thom reached inside my brain and wrote a series about my relationship. Anyone who hasn't been in a long-distance relationship will love this book. Anyone who HAS been in a long-distance relationship will love this book, too, but there will be more laughing and more crying. I'm rooting for these two!" "Quick-witted and heartfelt, Long Distance is an absolute charmer. In unpithy and unoriginal language: I liked it a lot and look forward to seeing more." "Thom Zahler brings humor and an insightful take on life to his work. His latest series is full of the engaging, quippy characters he's so excellent at creating." "For centuries, poets have struggled to put into words the magical, blind-siding, senses-rattling phenomena we call love at first sight. Here, Thom Zahler manages to capture it perfectly, not only in words but in pictures in his brand-new graphic novel, the humorous, touching, romantic adventure, Long Distance." "Thom has concocted a funny and touching tale of the trials and tribulations of long-distance romance. As he proved in Love and Capes, he has a great ear for dialogue, and an approach that makes you care immensely for the characters. Another win for a talented creator!" "Just like in Love and Capes, Thom Zahler does something very impressive in Long Distance. He captures those special moments in a relationship– both big and small --- and brings out their humor, passion and joy for all of us to share. “Long Distance” is your new favorite romantic sitcom that you will absolutely want to binge read." "Thom Zahler's Long Distance could have been titled Modern Romances. He does a delightful job of capturing genuine affection, and some of the peculiar dilemmas of really connecting in our technology-enabled and -tortured world." "Thom Zahler perfectly captures the excitement, nervousness, fascination, and fun of new relationships, adding his own pleasantly geeky twist. Romance comics, a sub-genre that died a hard death decades ago, are finally back thanks to Zahler." 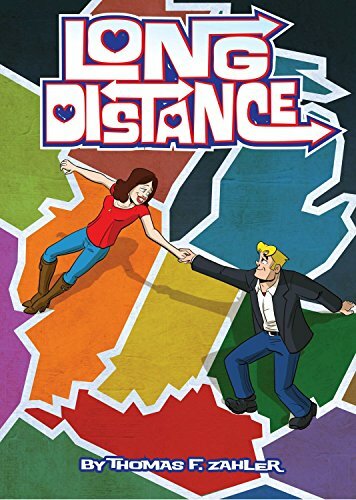 "Long Distance is a charming, heartfelt, witty and honest look at the joys and struggles of long-distance relationships brought to life by a writer/artist of great skill."